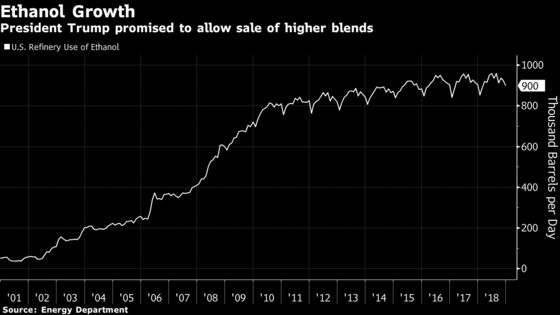 (Bloomberg) -- After President Donald Trump promised Iowa voters he would unleash high-ethanol gasoline, his administration fast-tracked a plan to lift summertime restrictions on the fuel, forgoing studies of its potential price tag and hastily ending a review of the measure. At one point, the EPA even justified not conducting a deep environmental analysis of its proposal by arguing that allowing year-round sales of so-called E15 gasoline wouldn’t actually give a big market boost to ethanol, undermining a key political promise driving the initiative. The regulatory shift won’t “significantly alter the penetration of E15” and “we do not expect this action to significantly change overall ethanol use,” the Environmental Protection Agency said. The comments were included in documents from a White House-led inter-agency review of the measure, released this week. They reveal how regulators skirted detailed analysis and brushed aside concerns about proposed changes in biofuel-credit trading that could bog down the measure. The documents also demonstrate how politics infused the entire effort, as the EPA sought to fulfill Trump’s promise to an important voting bloc: Midwestern farmers who helped send him to the White House. Ethanol in the U.S. is made mostly from corn. “President Trump promised it in Iowa and they had to deliver. It’s as simple as that,” said Wallace Tyner, an agricultural economist at Purdue University in West Lafayette, Indiana. EPA spokesman Michael Abboud said the proposal reflects interaction with other federal agencies and “includes an extensive discussion of the technical rationale, emissions and economic impacts, and costs and benefits associated with regulatory changes to allow gasoline blended with up to 15 percent ethanol” to be sold year round. The unusually speedy work to propose the shift for E15 gasoline came over just eight days in early March, as the EPA raced to finalize the change before summertime fueling restrictions take effect on June 1. The agency has been considering waiving pollution requirements for E15 gasoline for years, though only recently as part of this formal proposal. “In fact, EPA has been studying every environmental, economic, and legal detail of E15 since 2009 when the agency approved the fuel, and President Trump made a very public commitment that EPA would resolve the summertime ban on E15 a full five months before EPA finally produced this proposal,” Geoff Cooper, the president of the Renewable Fuels Association, an Ellisville, Missouri-based trade group, said in a statement. Despite the administration’s haste, it is still not clear the EPA will make its deadline. The EPA says it is working “expeditiously” to finalize the measure “by the summer driving season, consistent with the president’s direction.” But first it will hold a hearing on the measure Friday in Ypsilanti, Michigan, and it is taking required public comment on its proposal until April 29. All of that feedback is meant to guide EPA’s final rule, which must go back to the White House for another round of reviews before it is released. Although the EPA said it was considering providing additional analysis as part of its final rule, that approach would prevent public scrutiny and could open a legal vulnerability for critics to challenge in court. “In order to get the rule out the door, the EPA simply ran roughshod over most of the legally required analyses,” said Amit Narang, a regulatory policy expert with Public Citizen.